A few years ago a friend of mine associated with the movie business sent me a very early draft of the film Jackie. Noah Oppenheim’s script was first scheduled as an HBO miniseries, with Steve Spielberg set to produce. But Spielberg then left the project. At the time I read the screenplay, Darren Aronofsky was attached to it as director. And at that time, his girlfriend Rachel Weisz was supposed to play Jacqueline Kennedy. When I got done reading the script my friend asked me what I thought of it. I said, not very much, it seemed kind of dull to me. But I told him I thought it would get made because an A list actress would do it just to get an Academy Award nomination. In the six-year journey from first draft to completed film, Wiesz and Aronofksy split up and she dropped out as lead actress. Aronofsky eventually dropped out as director. But he stayed on as a producer. And it is probably through him that Natalie Portman was brought in to play the lead. They were quite familiar with each other since he directed her in her Oscar winning role in Black Swan. The film essentially deals with the four days from November 22-25, 1963. John Reed called his book about the Russian Revolution Ten Days that Shook the World. This film depicts four days that shook the world. But since the picture is so narrowly focused on seeing those events through President Kennedy’s widow’s eyes, the full impact of those tumultuous days is never approximated, let alone felt. For instance, we get scenes with Jackie Kennedy talking to an expert on the Lincoln assassination memorial service since she wants to model her husband’s funeral on that event. To my knowledge, Jackie Kennedy did three long interviews after the assassination concerning that event and her marriage. The interviewing authors were Arthur Schlesinger, William Manchester, and Teddy White. 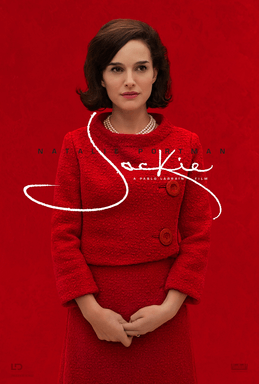 This film’s overall structure is based upon the long interview Jackie did with Teddy White for Life magazine after the assassination. (Although, to the best of my memory, in the draft of the script I saw, the interview was with Arthur Schlesinger.) There are numerous flashbacks from this interview, which takes place in Hyannis Port. 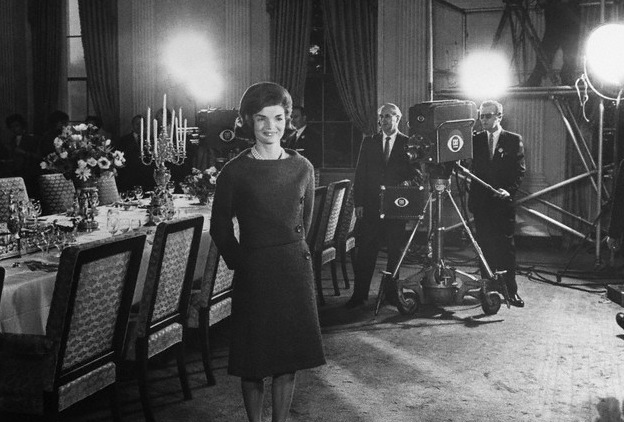 The main flashback is to Jackie’s famous tour of the White House. This was a TV special, initially broadcast on CBS, and NBC on Valentine’s Day of 1962. The program was a milestone in that no First Lady had ever done anything like this before. Also, it was the first time America ever got a long look at the interior of the White House, which JFK solicited two million dollars in private donations for restoration in 1961. The CBS correspondent for the program was Charles Collingwood. The show was viewed by a domestic audience of 80 million, and was eventually broadcast in 50 countries. There are other flashbacks; for instance to the actual assassination of President Kennedy, the swearing in of Lyndon Johnson, and some Kennedy cultural/musical programs in the White House. But besides the White House tour, the other main flashback frame consists of the preparations for Kennedy’s funeral. 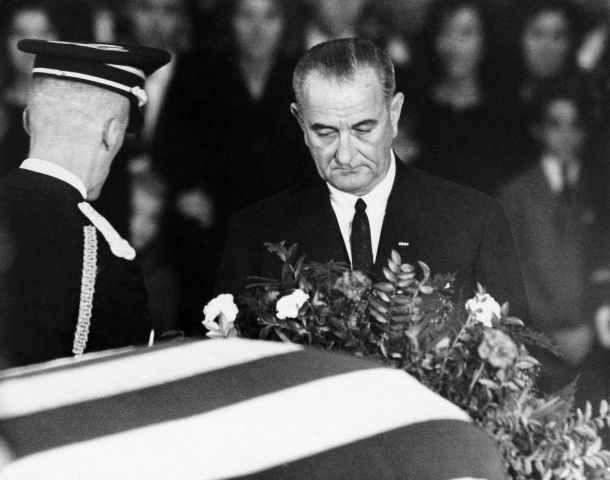 After Kennedy’s body was placed in the East Room of the White House, his funeral became a two part public event, taking place on November 24 and 25. On Sunday the 24th, the casket was placed in the rotunda of the Capitol building. Hundreds of thousands lined up to pay their respects. This viewing was scheduled to close at 9 PM, but because of the huge lines of people waiting outside, it was extended into, first, the wee hours of the morning, and then well past dawn of the next day. The actual state funeral was held on the 25th. Over ninety heads of state flew in for the mass at St. Matthew’s Cathedral and then the final procession to Arlington National Cemetery. The heads of state included French president Charles DeGaulle, Canadian Prime Minister Lester Pearson and Ethiopian Emperor Haile Selassie. President Lyndon Johnson also attended, even though many in government worried about a possible assassination attempt. Approximately a million spectators lined this route. A bit more than a week later, on December 5, 1963 the two deceased Kennedy children were reburied with their father. These were Patrick, who had predeceased JFK by 15 weeks, and an unnamed stillborn daughter. The film specifically mentions this fact. The picture ends with Jackie and her children on the beach, and her remembrances of dancing with Bobby and Jack at the White House. As I recall that early draft by Oppenheim, it suffered from a lack of any real gripping drama. Depicting an interview with a journalist and then recalling a funeral and a White House tour does not make for a lot of wide-screen drama or visual dynamics. Especially when millions of us have already seen both the funeral and the White House tour. Further, both are available on YouTube. The main conflict the early draft depicted was between the widow and LBJ’s assistant Jack Valenti and Lyndon Johnson himself. These concerned her control over the funeral and also how long she was going to stay at the White House after it was over. Although Oppenheim has said he did not change the screenplay very much in the ensuing drafts, I am not sure this is accurate. It appears to me that the final director, Pablo Lorrain, wanted to jab up interest in what was intended as and was better suited for a small screen TV project. And although Jackie did have a lot to do with the funeral arrangements, she was not by any means the only person involved in them. Again, RFK and McNamara, and the Pentagon were involved with these arrangements – the last since there were enormous security worries about another assassination attempt, the two most considered targets being LBJ and, as the film, depicts, Charles DeGaulle. But in watching this film, all Bobby Kennedy does is recall certain things about this brother and his legacy, and tries to keep the murder of Oswald from the grieving widow. But if that were not enough, there is also a scene where Jackie calls in Secret Service agent Clint Hill to see her, to congratulate him for his attempt to protect her during the fusillade. And she tells him she wants to talk to the accused assassin Oswald. In all the years I had researched the JFK case, I had never read anything like this scene happening. But I was not an expert on the Clint Hill/Jackie Kennedy relationship. So I consulted with Secret Service authority Vince Palamara. After exchanging emails with him, he said he did not recall this scene being related in any of the books Hill has written or co-written. And certainly not a request to talk to Oswald. Also, since Hill had been assigned to the First Lady from right after the 1961 inauguration, the formality and rigid cordiality shown in this scene would very likely not have existed. Further, the film tries to convey the impression that Hill rode on the trunk of the limousine all the way to Parkland. Again, according to Palamara, this is not accurate. He eventually snuggled into the back seat. And beyond that, there is even a scene where Jackie tries to walk into the autopsy room but she is turned away. My understanding was that the Kennedy entourage waited in a room on one of the upper floors of the Bethesda Medical Center. But again, I decided to consult with Palamara, and he said this did not happen. There are further jarring lapses with the record. Near the beginning of the film, when LBJ is about to be sworn in on Air Force One after the assassination, Jackie is depicted in the bathroom, wiping oodles of blood off of her face before the ceremony. Again, I can remember no photo or witness testimony to this happening. Just as I can recall no photo or film depicting her with lots of blood on her face due to the assassination. And in case that particular blood motif is not enough for you, there is a scene when she arrives back at the White House and takes a shower. Director Lorrain shoots it from behind, and we see water tinged in pink pouring down her back. Does this mean her hair was also saturated with her husband’s blood? 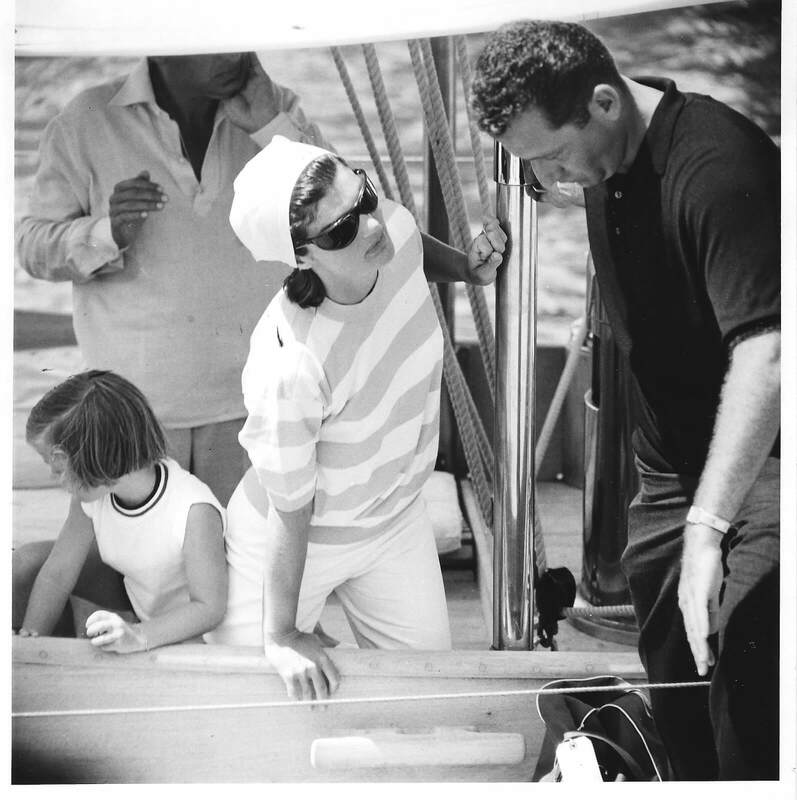 As for the film itself, the first thing we see is a tracking shot of Jackie walking back from outside to the house in Hyannis Port as the interviewer arrives. From that instant I had doubts about Lorrain’s ability to control the material. That kind of Kurosawa/Bergman camera strophe was too heavy for an opening shot of a film like this, or for the simple movement of Jackie walking back to begin an interview. Lorrain then slams close up after close up at us during the actual interview itself. Which made the scene play like an inquisition, when, in fact, the content of the interview is not like that at all. But even more surprising was the lack of rigor Lorrain showed with his cast. Billy Crudup plays White. It is an uphill part since it is all done in reaction. It has to be worked out in patterns of facial response, and through the eyes. It’s the kind of subtlety that the late Oskar Werner excelled at. Crudup is nothing more than adequate. Peter Sarsgaard is Bobby Kennedy. Sarsgaard has given some interesting performances in the past, for example in Shattered Glass and The Dying Gaul. Which makes it hard to comprehend how undistinguished, how pallid he is as RFK. If you can recall how memorable and precise Donald Moffat was as Lyndon Johnson in Philip Kaufman’s The Right Stuff, then you will see how much is missing from John Carrol Lynch’s rendition of LBJ here. Even good British actors like John Hurt as a priest Jackie confides in and Richard Grant as William Walton do little more than read their lines and collect their paychecks. The one qualitative exception in the supporting cast is Casper Phillipson. This Danish actor is spot-on as President Kennedy. So much so that I wish he had been in the film more. He gives his rare and brief scenes some much needed vitality. There has been a kind of combination media/industry networking effort to promote the idea that Natalie Portman should rank with Betty Davis and Greta Garbo for her acting in the title role. To me, it was a pretty monochromatic performance. Portman looked at a lot of film in order to capture the subject’s voice. And she noticed that there was a difference between the one that Jackie used for the White House tour and that which she used in more personal interviews. She then grieves and weeps a lot throughout. The part, as perceived by the writer, is so limited that the performance seems to be pretty much technical in nature. Portman spends so much effort in perfecting the surface, that there is not much left to actually articulate a character. There isn’t anything here that a dozen other actresses could not have done, either as well or better. All in all, it was a flat and disappointing film. Whoever decided that this script needed to be played out on the wide screen of a darkened theater was simply wrong. It seems that the writer and director realized that mistake on the way to production. As noted above, they then tried to justify that decision. In this reviewer’s opinion, it did not work. What is left is little more than an Oscar vehicle for Portman. And considering the subject, that should not have been the case.